The New York Times bestselling and multiple-Eisner-winning creative team of Greg Rucka (BLACK MAGICK) and Michael Lark (Daredevil) will release the second prestige hardcover in their ongoing critically acclaimed dystopian series LAZARUS this May. 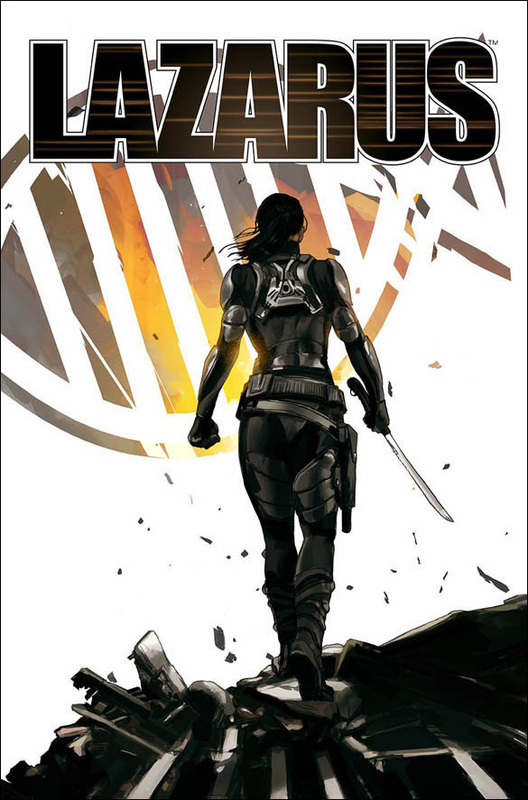 This collects LAZARUS issues #10-21, and includes extensive backmatter exploring the Lazarus world as well as behind-the-scenes looks at the creation of the book. In LAZARUS: THE SECOND COLLECTION, sixteen Families have gathered together in the exclusive luxury confines of Triton One to resolve the emerging conflict between Carlyle and Hock, and they’ve brought their Lazari with them. Deception and war go hand in hand, culminating in a final revelation that will truly change everything for Forever Carlyle. LAZARUS: THE SECOND COLLECTION HC (ISBN: 9781632157225) hits comic book stores Wednesday, May 18th and bookstores Tuesday, May 24th, and will be available for $39.99. It can be ordered by retailers with Diamond code FEB160687. It can be preordered now on Amazon, Barnes and Noble, and Indiebound.